I didn’t grow up going to the mountains or learning about pizzas and french fries as a grom on the ski hill. The way the story goes, my Dad took my Mom on a ski date before they got married, and one severe sunburn was all it took to never go again. A California girl through and through, I had maybe only seen snow five or six times in my life until my now-husband Nick Visconti and I began dating in 2012. At the time, Nick was a professional snowboarder and X Games athlete who spent his days chasing powder around the globe. Our whirlwind romance found me chasing the snow alongside him on countless road trips all over the US and Europe. I was working on my first book at the time, and would pluck away on my laptop at coffee shops while he strapped in at a local spot for a photoshoot or contest. 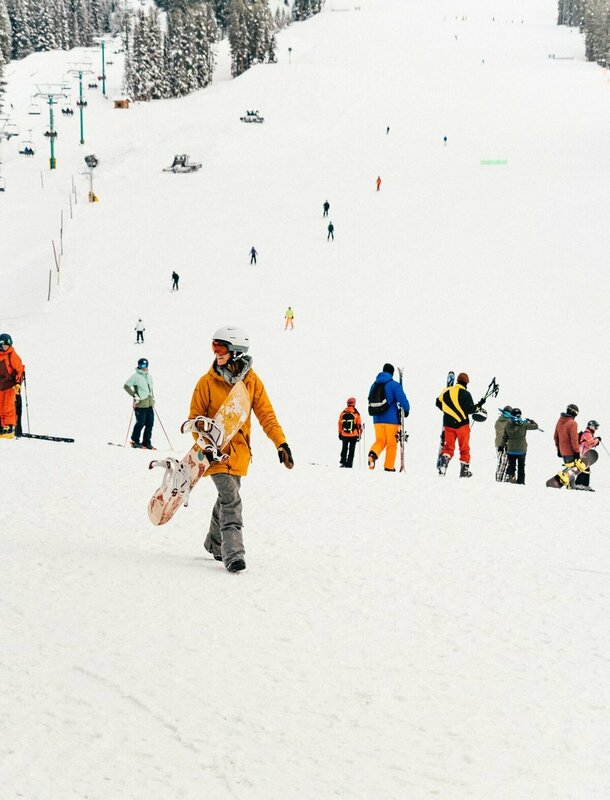 We’d reconnect in the evenings over après and it was in this environment — partying with some of the best snowboarders on the planet — that I fell in love with ski culture, and eventually snowboarding itself. It was literally the time of my life: the travel, the stoke, the salt-of-the-earth people that we’d inevitably befriend in each mountain town. Fast forward from my first impression of ski culture seven years ago to today, and I hardly recognize myself. Asking a friend where they have their season pass flows off the tongue just as easily as ordering an IPA at my favorite brewery. Today I call Lake Tahoe home and am fortunate enough to live and work nestled amongst the mountains. And with that, the desire to travel and experience other mountain cultures grows ever stronger. Nick and I traveled to Banff to explore SkiBig3 a few weeks back with Travel Mindset, and thoroughly enjoyed a good ol’ fashioned ski vacation. It was Nick’s first time visiting the Canadian Rockies, and my first time visiting in the winter: and sure enough, Banff has all the ski town charm and salt-of-the-earth humans you might imagine. While my first trip to Banff was a mere four months ago in the Fall, exploring the frozen Narnia landscape that is Banff National Park in the wintertime was like experiencing an entirely new place. If you’re traveling to Banff for a ski vacation, you’ll want to fly into Calgary International Airport (YYC). The airport is clean and easy — of course, getting through Canadian customs can sometimes be a bit arduous, but overall the experience was painless. We rented a 4x4 Jeep (we found that the roads were actually in really good shape despite the recent snow) and cruised the hour and a half drive into Banff National Park along the Trans-Canada Highway. Note: you will need to purchase a pass to enter the park, which you’ll affix to your windshield. We stayed at Fairmont Banff Springs which is a MUST — it’s literally a castle in the forest! Nick and I both agreed we’ve never stayed anywhere prettier in all our travels. Our room was comfortable and gave us a great view of the mountains outside, which were a bit masked in a blanket of frostbitten fog for the entirety of our stay, but we didn’t care — we were on vacation. Nick and I had the SkiBig3 pass, which gave us access to all three resorts. Our first destination was Banff Sunshine Village, an easy 20-minute drive from the hotel. While we heard others remark that this is more of a skier’s mountain, it ended up being our favorite resort we visited. After parking, you’ll hop in a gondola up to the top of the mountain, where most of the lifts are positioned. Our SkiBig3 Guides informed us that this resort receives more snow than other resorts in the area, largely blown in from the surrounding peaks and getting trapped in the bowl, and we were delighted to discover this was true. I can’t remember a day I’ve had so much fun snowboarding — or enjoyed better views. 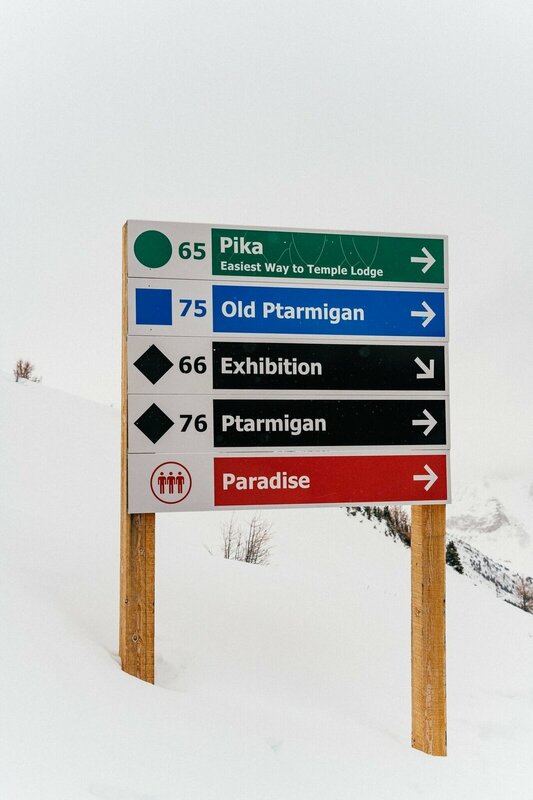 Inversion layers unveiled to breathtaking landscapes in every direction, as snowflakes lazily danced from the sky, adding to a perpetual never-ending pow day. It was magical. Lake Louise Ski Resort’s fame precedes itself: this was a mountain both Nick and I were dying to explore, and we weren’t disappointed. With countless steeps and never-ending rolling peaks dotted with ski lifts in every direction, you could spend your entire ski vacation here and still barely scratch the surface. Tack on stunning views of Lake Louise in the distance, and you’re truly in for a treat. After the last run of the day, drive down to Fairmont Chateau Lake Louise and explore the frozen lake. Having visited here a few months earlier, I was stunned how different the infamous turquoise waters looked in the winter: not only was the lake frozen over, but so much snow covered the ice that it merely looked like a snowy meadow. It’s safe to walk on, so explore and take photos to your heart’s content. Bonus points if you rent ice skates and play a game of pick up ice hockey in front of the Fairmont — although admittedly we didn’t partake: we were too busy enjoying après at the ice bar and watching an ice sculpture contest. When in Canada, eh? Our final ski day concluded at the family-friendly “local’s mountain” Mt. Norquay, which was the quickest and easiest drive from Fairmont Banff Springs. I actually wish we had started our trip at this resort, as it would be the perfect spot to warm up your ski legs. I loved the vintage vibes here! Nick and I enjoyed playing around for a few hours, soaking in epic views of Banff. Après here is a game-changer: leave the skis behind and head up to the picturesque Cliffhouse Bistro. 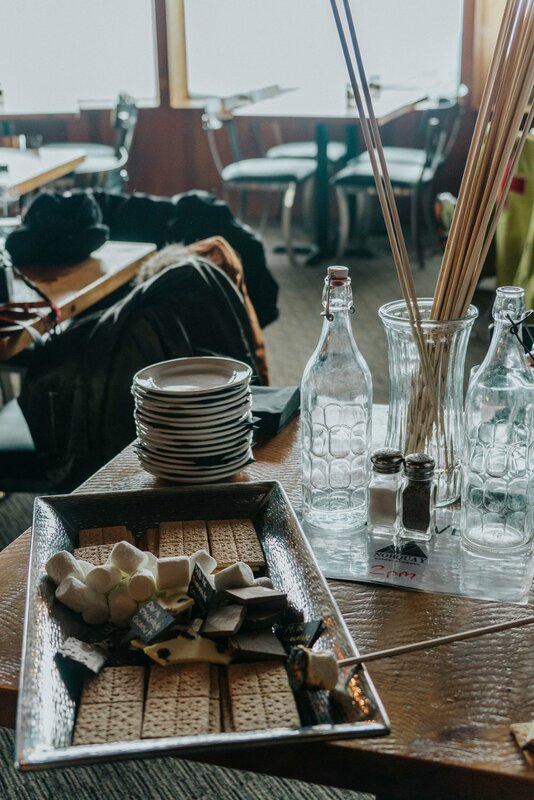 We enjoyed craft s’mores and — you guessed it — epic views as our SkiBig3 Guides told us mountaineering stories about each peak surrounding us. We didn’t end up going night skiing, but Mt. Norquay is the only resort in the area that offers this — particularly helpful if you’re just coming up for the day and want more bang for your buck! When Nick and I weren’t snowboarding, we were soaking in mineral baths at the Willow Stream Spa, and dining on Bavarian food at Waldhaus Pub. Mornings were spent soaking up WiFi and caffeine at STOCK, the beautiful café at the Fairmont. Just typing this is making me crave another green smoothie and hot coffee: our morning ritual! Gear rental is easy, or if you bring your own gear, Fairmont will store it for you downstairs near valet. And of course, you must spend some time exploring the town of Banff itself: we enjoyed a wonderful dinner at Park Distillery and strolling around being tourists. If you can’t already tell, I absolutely loved our ski vacation to Banff and am already planning another trip back! Canada is surprisingly cheap to visit right now — in fact, I would say coming from the Bay Area, you’ll spend the same amount flying to Banff for a ski vacation as you would coming to Tahoe as the US dollar is so strong right now. Have you traveled to Banff in the wintertime? What was the most memorable thing you encountered? This content is produced in partnership with SkiBig3 and Travel Mindset — as always, all thoughts and opinions are my own.